Peppermint fat bombs are the perfect antidote for sweet cravings, but without the sugar. And the magic secret? They will actually keep you full. 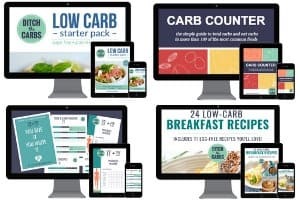 Scroll below to watch the quick cooking video and read on to see why eating more healthy fat, actually helps you lose weight. When you need something to curb those sweet cravings, peppermint fat bombs will do the trick. Peppermint fat bombs give you a healthy dose of beneficial coconut oil. These will keep hunger away and keep you fuller for longer. Coconut oil has many health benefits such as being antibacterial, anti fungal, its medium chain triglycerides are an excellent energy source for the brain, vitamins E, K and iron, aids immunity, weight loss and digestion. You can also add coconut oil to your smoothies or use it in baking and frying. If you still have a sweet tooth, these peppermint fat bombs will satisfy that craving for that sweet taste but have no added sugar and are almost zero carb. If you still find you are hungry but don’t want to reach for some kind of high carb snack, have some of these in the fridge or freezer. peppermint fat bombs will keep in the fridge fresh for a week or 2. You can even freeze them for longer. NOTE :: before you increase your healthy fat intake you MUST lower your carbs otherwise you are back on the standard American diet (SAD) which is high fat and high carbs AND the fat you eat must be a healthy fat such as coconut oil, butter, extra virgin olive oil, avocado etc. Peppermint fat bombs with coconut oil are the trick to stopping your sweet cravings. To make sure the sweetener dissolves, use the powdered version or grind some granules up in the coffee grinder or mortar and pestle. It makes for a smooth peppermint fat bomb. Keyword: Keto peppermint fat bombs. Mix the melted coconut oil with the sweetener and peppermint essence. Pour half the mixture into silicon cases or ice cube trays. Place in the fridge. This will become the white layer. Now add the cocoa powder to the remaining mixture, allow to cool, then pour onto the white layer which has set in the fridge. Pop back into the fridge until set completely. could I make these without sugar. currently on a no sugar kick and i know peppermint is good at curbing an appitite! There is no sugar in this recipe – yay! How long do you refrigerate the first layer before adding the chocolate layer? I waited an hour and they were still liquid. Coconut oil should harden in the fridge within minutes, it has a very low melting point. Did you add something else or use liquid coconut oil? MCT? 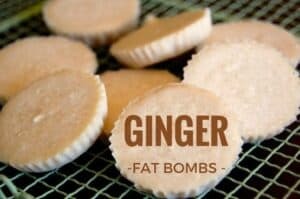 These are my favorite fat bombs! I no longer miss my York Peppermint patties! Thank you for the recipe. Can you replace the peppermint with vanilla extract? 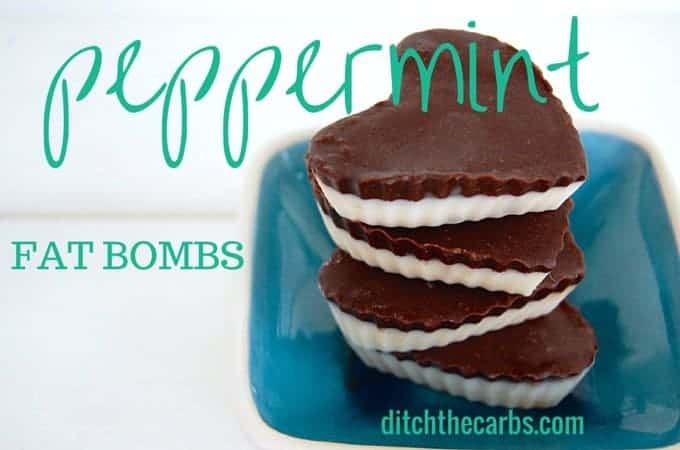 I made them and loved them but my husband hates peppermint. You can change the peppermint for vanilla, but you also might want to try my chocolate fat bomb recipe instead. I also have ginger, mocha, blueberry and coconut flavours. I usually read the comments before trying a new recipe. I forgot this time and it came back to bite me. I should have known that a granular sweetener wouldn’t dissolve in fat. Maybe grinding or dissolving the sweetener in some water before mixing in or using a liquid like stevia would work. Unfortunately, I had to dump everything in the trash. The recipe should really be updated to use a sweetener that actually works because using a “granulated sweetener of choice” is setting up everyone for disappointment. Luckily you don’t need to scroll through the comments, there is a note right at the top of the recipe “To make sure the sweetener dissolves, use the powdered version or grind some granules up in the coffee grinder or mortar and pestle. It makes for a smooth peppermint fat bomb.” However, I have also amended the recipe to show powdered sweetener for those of you who may have missed this. I hate to have wasted ingredients. You could have softened the grainy fat bombs again, stirred a few times as they are cooling and the undissolved sweetener would become suspended in the coconut oil. 1- I had problems mixing 1 tbsp swerve to the melted oil. Any tips? 2-Doesn’t the second layer melts the first one? If you are having trouble dissolving the sweetener, sometimes using the powdered form helps. The second layer shouldn’t melt on top of the first one as you allow the second layer to cool slightly before pouring it on top. I’m sorry but this is terrible, the sweethbsss is not enough and granulated doesn’t mix with straight oil. I had to strain it out and use liquid and it was still not enough. It tastes like slightly sweet oil when it melted in my mouth. The peppermint is too subtle. Not worth the fat. PB fat bombs are worth it, this was a waste of my coconut oil. I’m new to the Keto diet so I made these as a quick snack. Im not used to sweeteners or the texture of coconut oil so this was a little weird for me. I’ll be linking back to your site on my post. I’m documenting my experiences and results. 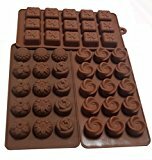 I just bought the cutest ice cube trays specifically for making fat bombs. I will break them on this recipe. Thanks for sharing! I have been trying to get my family to get my Dad, who has Alzheimer’s to eat coconut oil. I have read that 2 tablespoons of coconut oil twice a day helps reveres Alzheimer’s. No one in my family is interested in trying it. This recipe is exactly what I think will help. Thanks so much for the recipe! I wonder if I can add butter or fresh cream for a smoother finish n taste? If yes, how much butter and/or cream do you recommend? Yes you could, but I think you would have to freeze them as butter has a lower setting point than coconut oil. They might be too soft otherwise. There is only 6 servings in this? It makes 6 large peppermint fat bombs, and the nutrition panel is per serving. If however you can easily make them smaller (as shown in the video) you could easily make 10 or 20 mini ones. Then the nutrition would be much lower accordingly. Are these 200 calories per fat bomb? Don’t see the serving size listed on the nutrition facts. Yes, each nutrition panel is per serving. I appreciate, that each nutrition panel is “per serving” but the question is how many in a serving. So, for this recipe if I am reading comments and your nutrition sheet correctly the amount makes 6 patties and one patty would be a serving? Yes, 1 patty would be a serving. Each recipe will always state how many servings, and the nutrition panel for each serving. Some people choose to eat more or less than a serving so you can add the macros (or a portion of them) to your daily count. Tried these and they were delicious. I used erythritol which didnt disolve but I actually liked the crunchy “sugar” texture. My only issue was I couldn’t eat more than one a day. I think the amount of coconut oil was a problem for my tummy, which reacted similarly with mct oil.. if you know what I mean. Hi I’m allergic to coconut what could I use instead?? Unsalted butter or raw cacao butter can be substituted in most cases for coconut oil. I do this all the time for variety. 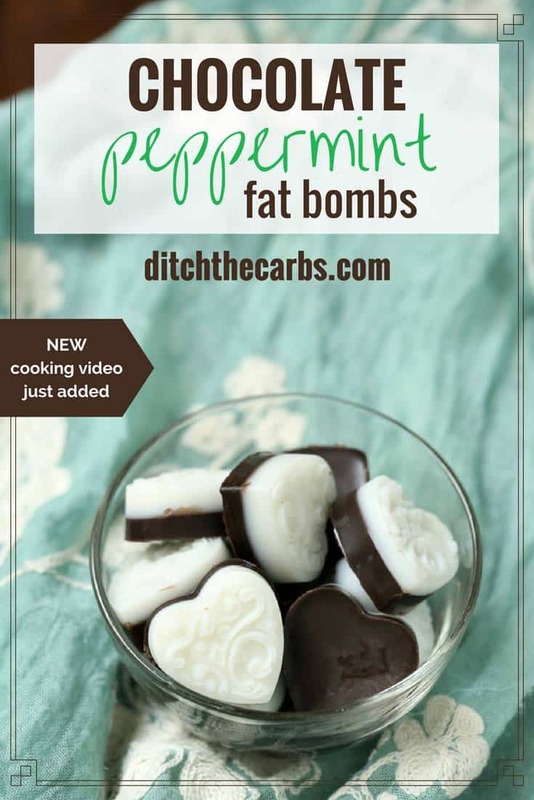 I love your blog post, PEPPERMINT FAT BOMBS, and we would love to feature it on our website, GreenThickies.com. Would it be OK for me to use one of your photos within my post? I will of course link back to your post. These are so easy to make and so delish! Thank you for all your heard work and sharing your recipes. This did not work for me, I used Xylitol sweetner and it would not blend with the coconut oil, just created gooey lumps in the oil. How much is 125 g of coconut oil when using measuring cups or spoons please? All the sweeteners I use measure spoon for spoon in place of sugar. So 1 tsp granulated = 1 tsp powdered. The liquid stevia you are talking about should work, but with all sweeteners you have to add enough for your liking and your sweet tooth which will be completely different to mine and others. This is a page I wrote on sweeteners, which I use and which I avoid. Liquid drops are great but very easy to over /underdose. Libby my sweetener ends up grainy like sugar that hasn’t dissloved properly. Am I doing something wrong? I use Natvia in the cannister. Sometimes this can happen if the oil is over melted so the Natvia sinks to the bottom. Melt it only enough to stir in the sweetener, pop it back in the fridge so it is little firmer, stir again so the sweetener is mixed (almost suspended) in the coconut oil, then pour it into the moulds. Alternatively you can grind up the granules in a coffee grinder, spoon and cup or mortar and pestle to be finer and easier to dissolve. There is also a powdered icing sugar version too. 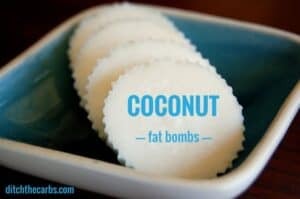 Are there any fat bombs without chocolate or coconut and made with butter? Take a ook at this Fat Bomb book, it has the most amazing selection of fat bombs out there. Love the variety of ideas on your site. I’ve made these, the ginger bombs & the chocolate ones with the tahini & walnuts. But I have terrible trouble with getting the sweetener to dissolve. I resisted buying sweetener for ages & finally gave up & bought some Crunch, Sugar free crystals from Countdown in Dunedin. They are supposed to have the crunchy texture like sugar which helps for baking. Not that I bake any more really but it was on special & the other stuff wasn’t!! Maybe the crystal texture is causing the problem but it’s the same ingredients as other sweeteners & I see a few others have had similar problems with whatever sweetener they use. I like the concept of the bombs but I had been heating the coconut oil too much to try to get the sweetener to dissolve which, of course, made them very odd in texture. I see that softening only is the way to go. But how to avoid a spoonful of almost undissolved crystals at the bottom? Any suggestions? Should I try another brand maybe? I would try Natvia brand. It is available at most supermarkets in NZ. Natvia even make a icing mix (sugar free) but it can be really expensive. Those Crunch crystals can be really difficult to dissolve unless you grind them up first. Don’t over heat the coconut oil, in fact heat it just enough to just melt, add the othervingredients then even try popping it back in the fridge to be almost setting but soft enough to pour into the moulds. Mix just before pouring then the sweetener should be evenly distributed. Thanks. I tried them again last weekend. I ground up the crunch crystals to a fine powder with a small mortar & pestle. Worked much better. Will get some Natvia at some stage but I’ll use this for a bit. I didn’t bother to do separate layers. Just mixed it all together. Worked just fine. I had really good luck with Swerve. I used the confectioner’s style and it dissolved very nicely. The consistency was pleasant and they taste awesome! I had to use peppermint extract instead of peppermint essence. I think next time I’ll add a little more peppermint. Thanks for the recipe! I made these this weekend…perfect for my taste! 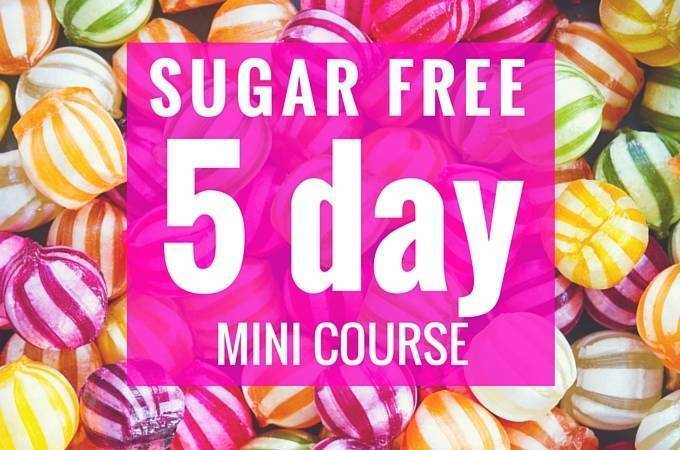 Since starting LCHF nearly 18 months ago I have drastically reduced my cravings for sweet things so I might even cut back on the sweetener in this recipe. I dissolved most of the sweetener because it had clumped – low heat & lots of stirring. Anyway, very pleased with the result and already thinking about other flavours. These are awesome! 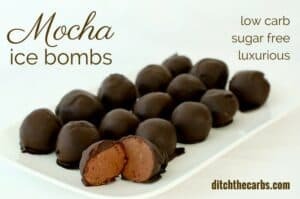 The perfect dairy free fat bomb that I was trying to find, and I had all the ingredients to make. Also, I did use peppermint essential oil and it is also food grade. Try grinding the sweetner, it worked in my case (I use pure erythritol and grind it before use everytime.). It was definitely the coconut sugar (which is no healthier than sugar). If the sweetener doesn’t dissolve and mix in with the coconut oil then yes it will taste like bad flavoured fat. that’s also the reason why it wasn’t sweet at all, especially if you skimmed it off. The coconut oil should be melted, not hot so that may be another reason why the recipe failed. I’m sure you will have better results next time, it is really a popular recipe. try Swerve sweetener, it is a blend of stevia and erythritol, you may like that taste. It would be roughly the same but add according to taste. It is hard to answer accurately because so many brands interchange cocoa and cacao and other factors which affect the final chocolate taste and bitterness. You may also have to adjust the amount of sweetener you use. I’m a bit confused…when you refer oz. in your recipes are you speaking of weight or volume? Weight unless stated fl oz. 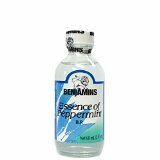 Hi, can you tell me what peppermint essence is? Would this be the same as peppermint extract? Yes, any peppermint flavouring that is edible and food grade (not the essential oils that are for topical use to rub on). Is peppermint essence the same thing as peppermint oil?? I have some peppermint essential oil I could try. Hmm, not too sure, is the peppermint oil food grade not an essential oil? I am an aromatherapist and use essential oils for flavouring so yes they can be used instead. Manufacturers use them all the time in things like orange juice to give it more flavour. hearttt …………..wow n like chocolateee cakee.. Thank you, thank you!! Just a quick question. I’ve tried the recipe with xylitol, but the xylitol did not want to dissolve. Any advise? I don’t use xylitol so I did a quick search and many people have the same problem with getting it to dissolve or it forms a big clump. The one idea they did try was to heat the xylitol and oil together then mix and let it cool until it is thickened but not set. Once it is thicker you can keep mixing the xylitol through and it will be distributed more evenly than if you pour it melted and it’s all sitting at the top. Let us know if their idea works. I grind xylitol into a powder, then it dissolves easily. I use a Magic bullet, but any type of grinder would work. I made some of these the other day. Dropped one in my morning coffee, tasted like a peppermint mocha. Yum!! Love your website! 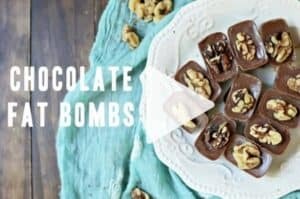 Will definetly try the “fat bombs” they look delicious.. I agree. Thanks for the reminder and cannot wait to try these. Going to try these. I liked the reminder up there at the beginning.